Invest in yourself: learn by doing. Read on to learn how the NerdKits philosophy is implemented in our kits, and why other electronics kits will leave you intellectually unsatisfied. Ultimate Electronics: Practical Circuit Design and Analysis is an online interactive electronics textbook. Due to increased demand, the LED Array Kit and Full-sized Multimeter (two of our most popular items) are currently out of stock. NerdKits announces the launch of CircuitLab: in-browser schematic editor and circuit simulator! 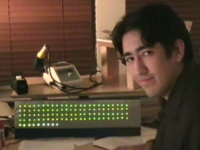 Look at our LED Array Kit for a stunning, programmable LED display that you can build! "So what attracted me to NerdKits ... and what will keep me going back to them? Most importantly, the excellent support." A NerdKit is a combination of electronic parts and wisdom, which together will teach you about digital electronics, embedded systems, and how to bridge computers with the "real world". The electronics world has changed dramatically in the past few decades. We want to make sure that it's still easy to get involved with modern technology, and to experience a challenging and rewarding hobby! A NerdKits microcontroller kit is appropriate for software hackers looking to branch out into electronics, and has educational material to allow even middle-schoolers and high-schoolers (ages 12+) looking for a fun challenge to learn by doing, especially with the help of a techie parent! A microcontroller is a small computer on a single chip, including processing, memory, and inputs and outputs -- see the Wikipedia page for more information. Kits for a digital generation. Decades ago, amateur radio was the home of hobbyists. Old school "100-in-one" kits are still around, but this is the digital age, and educational electronics kits haven't been updated. Flexible to experiment. For someone just getting started, not yet possessing the confidence in their design skills, it's important that parts be cheap enough that breaking them isn't going to be a heartbreak. Others sell starter kits for $150 or more -- too much for someone on a student budget to take the leap into a new field. Our microcontroller boards have easily replaceable parts, instead of being stuck with one bad burnt-out component ruining an entire circuit board. 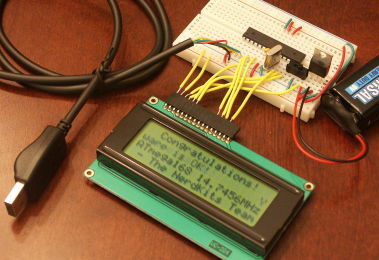 Additionally, NerdKits include powerful parts like an LCD display, which you won't find in other starter kits. Guidance to get started, with intuition and wisdom. While MIT may be known for bestowing its students with rigid mathematical analysis skills, it's also true that a significant focus in our engineering classes was on learning the intuition crucial to being a successful designer. Through our included documentation, we'll walk you through the steps of getting started. The real thing! Our kits don't give you a fixed, watered-down system like others do. We give you a lean but powerful chip, supported by a powerful open-source C compiler to help you learn microcontroller programming. And we help you design your circuit yourself, instead of constricting you to a fixed layout. When your skills have advanced and you're ready for more, there's a large community of amateur and professional developers on the internet. The educational opportunities here are amazing, and we've taken this hobby, pursued it in college, and turned it into a career. But we can only imagine if we had a kit like this one when we were in high school! 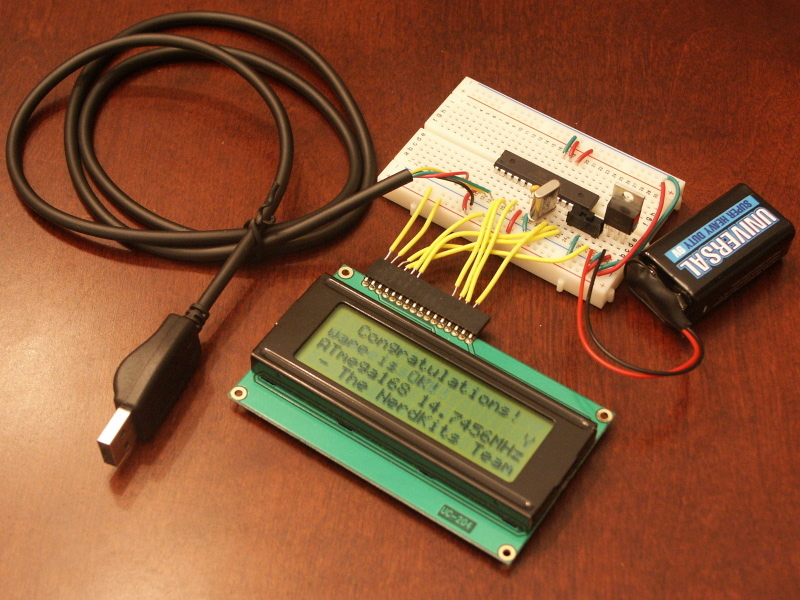 Most motivated middle-school students should be capable of making interesting projects with the NerdKit. Lots of people these days have some understanding of computers and simple computer programming, but we'd like to push you further. With microcontrollers, you can touch the real world with inputs and outputs -- sensors and actuators -- some of which are included in the NerdKit, and many others which you can add yourself. And we hope you'll discover the same passion we have grown for this exciting hobby. "Thanks guys, I think your kit is exactly what I need to get started poking about with hardware. I've wanted to do that for a while, but everything I could find was either too dumbed-down, too locked up (step by step, and nothing else), or too over-my-head (assuming I'd majored in EE or something)." Why should I get a NerdKit? Step-by-step instructions are included. The documentation we include walks you through the steps required to build a simple project. And, in contrast to other kits which just give you a set of steps to follow, we try to give you the intuition behind why those steps exist. No soldering! Out of all the steps of the assembly process, newcomers to the field are most likely to cause damage to the sensitive integrated circuits when using a 700°F tool to solder joints, and soldering can also be a source of burns if one's not careful with the tool. We use solderless breadboards so you can change your design more rapidly without waiting for your soldering iron to heat up. A completed design (with room to grow). With our kit, you know you won't be missing any vital parts that will delay your development, since we've already figured out what's needed to build a working system. "Got your kit and got everything working. 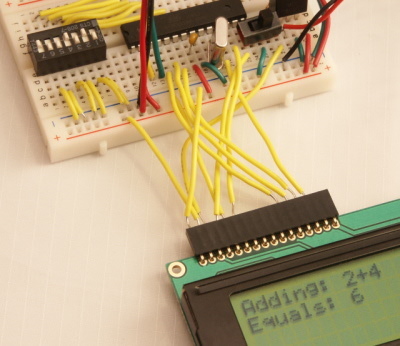 Love the kit -- exactly what I need to get started with microcontrollers. Told all the folks at work about it." I'm scared to jump in. If we can leave you with one message, it's simple: don't be afraid. The purpose of NerdKits is to reduce the risks involved with getting started in the electronics field. By doing so, we make digital electronics available to a much wider population, and additionally increase the chance that you'll be successful in this endeavor. I'm excited. How do I get started? 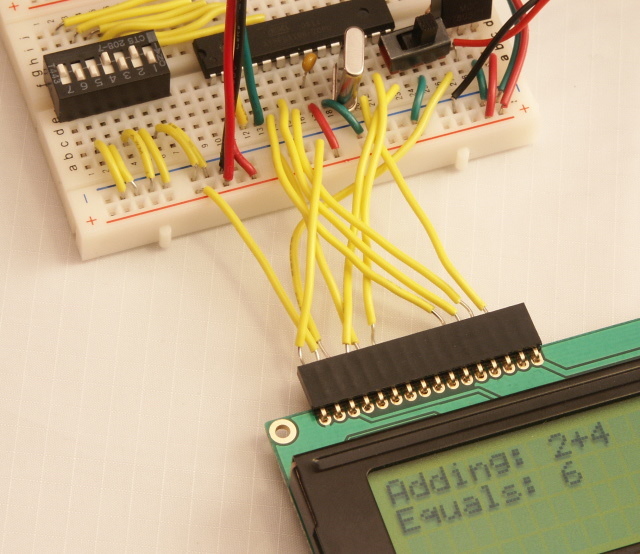 If you're ready to learn electronics, click the button below to read more about our current microcontroller kit offerings!